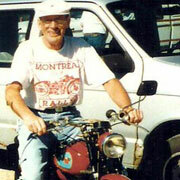 Started his motorcycle career in Halifax in 1951. In 1952 he acquired his first Motorcycle, a 1940 Norton Model 18. 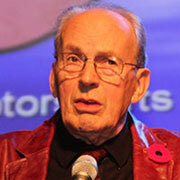 From 1952 through to 2004 Gerry was a touring rider in Germany and North America. 1957 the first ever Canadian National Scrambles Championship was run at Delson, Quebec, Gerry won the 500cc Export riding a A.J.S. 18CS. 1958 & ’59 he took 1st overall in SMCC One Hour Scramble. In the 70’s, competed in road races at Penfield Ridge NB. He won the 76-mile McConney race overall, Debert and A.M.P. At A.M.P. he set the original lap record for motorcycles at 1 minute 25 seconds during the inaugural race. 1993 the Ironman Award at Rocky Ridge Pastmasters Trails. 1995 first in Pre 1965 Expert, AHRMA Trials, Ocala Florida.